SIP Phones for VoIP from Yealink, Polycom, Snom. Hotel IP Phones. Hong Kong, Singapore, Malaysia. Since its establishment in 2001, the Chinese enterprise, Yealink has been committed to manufacturing innovative IP Phones with high quality, easy deployment, rapid technical support and broad interoperability, which makes Yealink has been identified as one of the top 5 SIP phone suppliers in the world. Yealink products enable timely communication among branches, allowing all staffs to communicate with peers, vendors, and customers on the other side of the world just with less than three touches. Yealink SIP phones support open standards and Asterisk based PBX's and our CloudPBX. Yealink provides quality at a great price. Yealink are our first choice recommendation. Recommended models include entry level T21P, T22P and gigabit phones T23G, T42G, T46G and new T48G. The H-Series is Fanvil’s newest series of IP phones designed for hotels. Its stylish, contemporary appearance, excellent voice quality and powerful functionality, along with matching integrated communications platforms can replace traditional phones and can become a new generation of intelligent terminal equipment. The H-Series hotel IP phone will look great in most hotel rooms andwill support most application requirements. In addition, it has excellent call quality and support for external USB connector allowing guests to charge their mobile phone. Three models to choose from including bathroom wall model. Integrated with our CloudPBX available. Wireless or CordlessVoIP Phones. 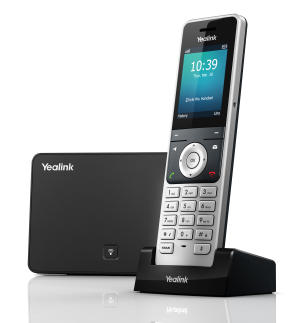 Yealink offer the W52P and W56P Wirless DECT IP phones. These have been designed for those people on the move in a warehouse, retail or other such location. Also work very well for those businesses that work across Wifi for their laptops and have no structured cabling installed in their office.